When I saw this mezuza, I knew immediatly that it is pasul. No normal sofer writes the [left] regel of the hai such! Obviously the sofer?? didn't learn how to write!! Not pretty nor written with a proper mesorah, but bidieved should'nt the ה be kosher? I assume the sofer was trying to make a "Pesiah Levar" but batched it up. 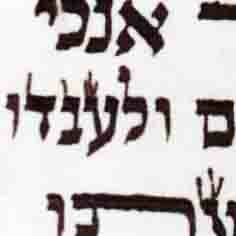 Still it does not resemble a tav, and bechlolus looks like a ה. Are you saying it is posul out of chashash etc.. ? You hit the point exactly! If one [maybe two?] hai as such would occur, I would accept this as a mistake then judge as you wrote, and accept the hai as kosher since this isn't a shinuy tzura and bdieved is kosher. But, since I saw all his hai of shem hashem [obviously he was trying to do a psiya lebar as you wrote] as such, and there is no mesora to write the hai such, I knew immediatly the sofer?? didn't learn so obviously the mezuza is pasul. Search the mezuza you will probably find other psulim also!! His vavim also look a bit short at times (vehasafta, veyitzharecha), and the first hey of "asher Hashem natan lachem" looks a bit like a taf. The mem of "lahem" also looks to be problematic. Thanks for pointing out the problem of "lahem" bezras hashem after shabbos I will prepare a post about the issue. DONT THINK ITS POSUL! ALTHOUGH HE PROBABLY DOES NOT HAVE KSAV KABALA AND DOES NOT HAVE CHEZKAS KASHRUS! The hai resembles a broken tav. 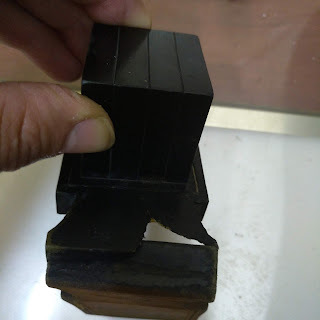 I wonder if the maharshag can be used here.as i posted the maharshag is machshir a chaf vav that are very close although it looks like a mem and if mem is needed in this spot it may be corrected.We might not apply the maharshag here since the chaf vav are done correctly the only problem is they are close however in our case the heh is not built like a heh it is built like a tav. There is a difference between checking and passing this mezuzah to actually selling such mezuzah. If this mezuzah came to me for bedikah I would be machshir it. Yet obviously one should refrain from selling such a mezuza, even as an el cheapo, as it is way below the minumum standard that any reputable vendor should be dealing with. Besides the fact that it is clear and obvious that the sofer is not qualified. Again the question is not in regard to one hai - that would be dealt as a shaylas tinok [although some of them are realy problematic. The concept of the Maharshag doesnt apply at all here, the Maharshag is talking about 2 separate letters, here the nekuda in the challal may have changed the total [one] form [of the letter] to a tav (even a pasul tav, since its diconnected). I want to emphasize again - that immediately upon seeing the mezuza I knew that the man writing it wasn't qualified so obviously the mezuza was pasul. Shavua tov. 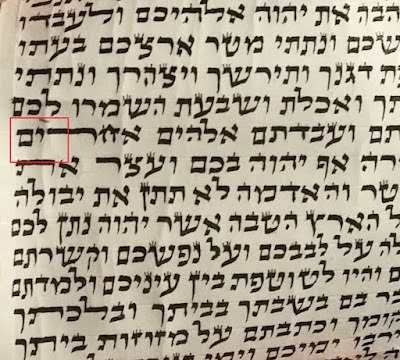 I couldn't see from the photo the R"T kots in some iudim, as in shem Hashem (2), hadvarim (3),levanecha(4)etc..
into the letter, maybe more than half a gag inside, like in uchTavTam(8), Titen (14), uchTavtam(19). In meZuzot (6), is the first zain reminds a dalet? In Deganecha (10), is this a guimel bagdadi? In baM (18), is this a sheilat tinok (like in Otiot Harav, pic.31)? In bneIchem (20), the iud is a bit long. Elad thanks for clearing that up.The Mem of Lahem doesn't look that bad ;at least on an iPod.The last letter of Vesiroshcha looks like a Raish. The Chaf Pshuta in V'siroishcha (line 10)looks like a reish to me. Would any of you be machsir it? No, I did not actually check this mezuzah. My comment above - about being machshir such a mezuzah - was in relation to reb moshe's point about the hay, ie the ksav has some abnormalities which are not meakev but indicate that the sofer may not be properly qualified. Reb Moshe seemed to be indicating that you should passel it even if you don't find an outright psul. I would be machshir such a standard of mezuzah (assuming there is no outright p'sul) if it was brought to me for bedikah. Unfortunately I get many such mezuzos that have been purchased at Judaica shops etc. I cannot be gonez half the mezuzos in melbourne simply because, as Dovid says "They are not pretty or the sofer lacks proper mesorah". However if there was an outright psul, then obviously that changes things. But even without an outright psul I would certainly not consider it lechatchillah fit for sale and I would consider it unscrupulous and highly irresponsible for anyone to sell such a level mezuzah. is definitly pasul, it is more a tav than a hai.